Amazon had a big day on Thursday with the release of the portable next generation Amazon Tap. 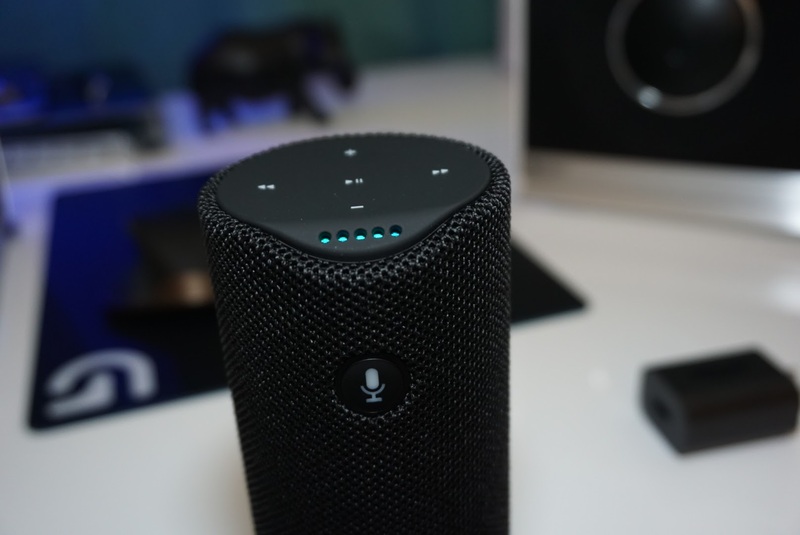 The Tap is a follow up to the wildly succesful and popular Amazon Echo smart speaker which has quietly been impressing consumers for the past year. What makes the Echo special is its ability to answer questions and commands with the simple wake word “Alexa”. Once you say, “Alexa”, you can tell it to play music, turn your smart lights on or off, turn up/down the temperature on your Nest thermostat, give the latest news from NPR, buy more paper towels, or even tell you a joke. The commands you can give it are almost endless. In the kitchen you can ask Alexa to help you convert grams to ounces, create a shopping list, read you a recipe, play Bluetooth music, and to set a timer. In the bedroom you can have your Echo set alarms, tell you your next appointment, and play you relaxing bedtime music. What is great about the Echo, is Amazon is continually rolling out new features every few weeks. Amazon has put in untold dollars into making Echo great, and up until Thursday March 31st, the biggest downside was that it always needed to be plugged into a wall socket. As an addition to the Alexa family, Amazon released the portable Amazon Tap that can perform the same functions as its big sibling. In the box you will get a hefty little speaker that fits in the palm of your hand and stands upright. On the front is the a microphone button that replaces the power hungry always listening microphones on the Echo. 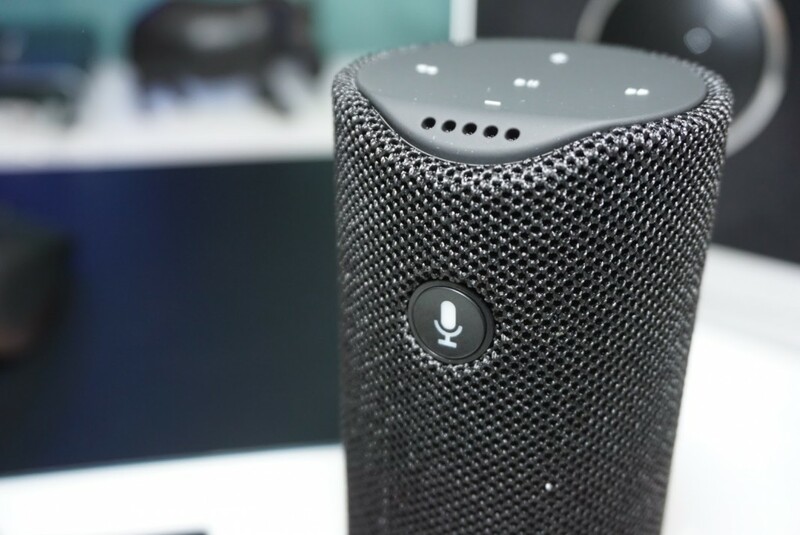 In order to go portable, Amazon installed the mic button where users can press it and start giving commands or asking questions. In order to set up the Amazon Tap, you will need to goto the Google Play Store, or Apple App Store and download the Alexa app. Once downloaded, you simply sign into your Amazon account and goto settings, and look for the Tap in the drop down menu. Simply follow the instructions by connecting to the Tap’s WiFi, and connect it to your home or other WiFi hotspot. I have read reports of the WiFi hotspot not working for some users, but for me with AT&T on my Samsung Galaxy S7 edge, it worked just fine. 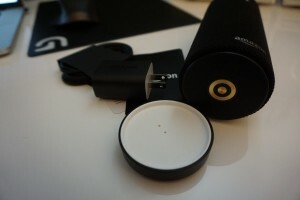 Once setup you can start using it by pressing the mic button on the front of the speaker. If you’ve tried the Echo, Amazon Fire TV, or Fire tablets before, you can have full confidence that the Tap is just as well built and lives up to the high build quality standards Amazon places on its products. The Tap is a 360 degree speaker, so no matter where you place it, you will get sound that permeates throughout the room. It is a solid polycarbonate cylinder with a mesh cover that guards it against dust and dirt. On the top are controls protected by a soft rubberized cover – fast forward/rewind, play/pause and plus/minus controls on the top. On the back is where you will find the Bluetooth button that you will need to use to connect your Tap to your iOS or Android device. Also on the back is the power button and microUSB input for charging. The Tap also comes with a wireless charging base that is the same circumference as the speaker, and is a very nice addition for a reasonably priced $129.99 device. Amazon claims nine hours of use with the Tap, and so far I have pushed it to six full hours and it is still going strong with 2/5 dots remaining on the power meter. The speaker itself does provide 360 degree sound that is loud and crisp. I wouldn’t say it is earth shattering when it comes to bass, but it does sound great. 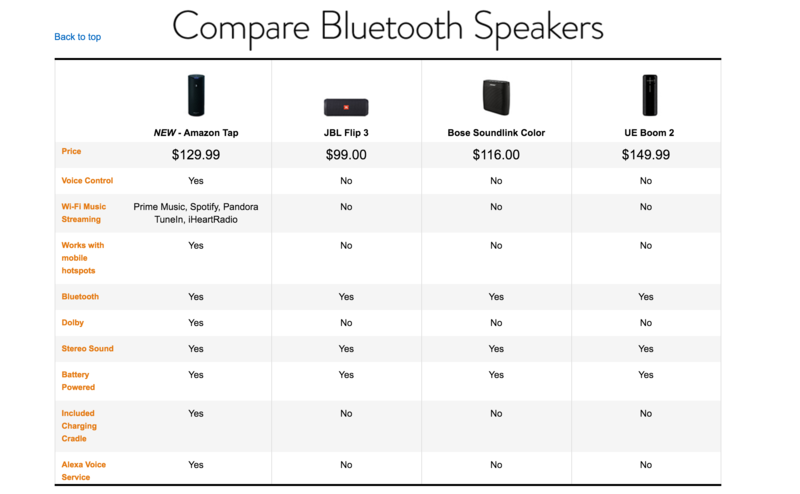 I have heard quite a few Bluetooth speakers in the same price category, $99.99-$149.99, and the Tap is comparable if not better. 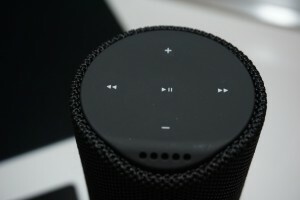 The popular Bose Soundlink Color, and UE Boom 2 come to mind as popular competition, and I would pick the Amazon Tap any day of the week over those two. 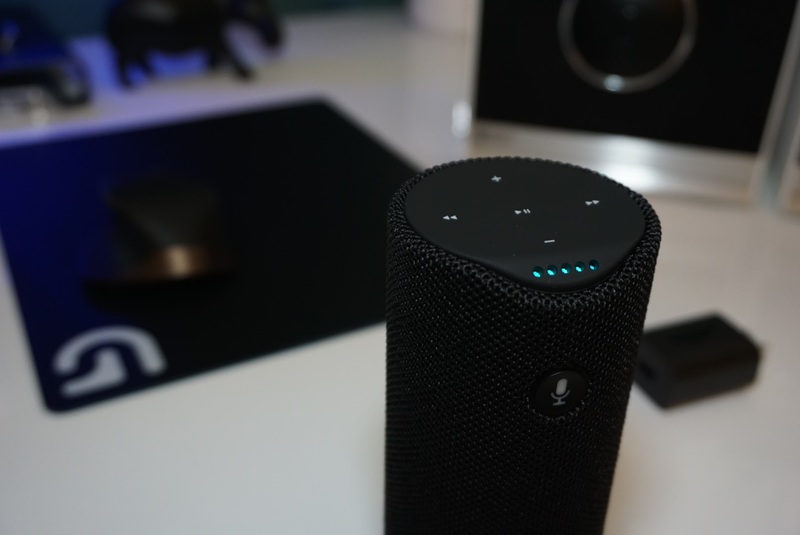 Not only does it offer similar if not better sound quality, but it also offers the powers of Alexa that should not be underestimated. Those speakers can only play music – they can’t create shopping lists, tell you the time, and don’t even come with wireless chargers at a very similar price point. The Tap can stream music through WiFi from Amazon Prime Music, Spotify, Pandora, TuneIn, and iHeartRadio. If you use other music services like I do, such as Google Play Music or TIDAL, you can simply play music through Bluetooth like you would with other portable devices. In order to pair the Tap, all you need to do is press the mic on the front, and tell it to pair via Bluetooth. 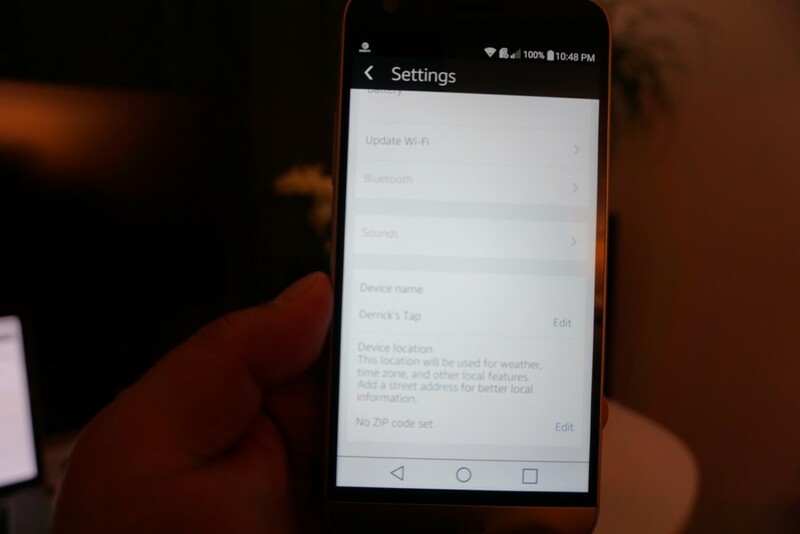 Goto your phone or tablet settings and simply connect to it through your Bluetooth settings. Then simply start jamming out to some tunes. So if you want to play music, create shopping lists, ask for unit conversion help, hear the news, set alarms, or control your smart home, the Amazon Tap has you covered in a wireless package that last nine hours on battery. At $129.99, I consider this to be a great value for something that can do so much for you beyond playing great sounding music. If you already have an Echo, then you know the value of Alexa, and adding the Tap is an addition you need to do if you haven’t already. The Echo and Tap are some of the best products you can add to your tech arsenal now. The free Amazon Alexa App is a companion to your Alexa device for setup, remote control, and enhanced features. Alexa is always ready to play your favorite music, provide weather and news updates, answer questions, create lists, and much more. 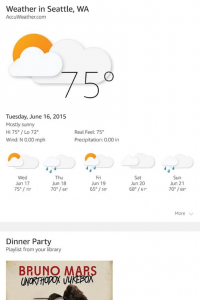 Alexa’s brain is in the cloud, so she continually learns and adds more functionality over time. The more you use Alexa, the more she adapts to your speech patterns, vocabulary, and personal preferences. Interactions with Alexa are automatically mirrored visually on your Amazon Alexa App, providing more information as you want it. The Amazon Alexa App lets you easily manage your alarms, music, shopping lists, and more — wherever you are.